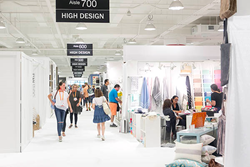 The Market’s 61st-annual summer staging promises new introductions, new product collections and presentations and industry-leading programming featuring celebrated tastemakers, business visionaries and innovators across its newly timed seven-day run. Leading the July Market lineup is expanded AmericasMart® LIVE programming delivering new experiences and an all-new coterie of globally celebrated talent including lifestyle legend Martha Stewart, business mogul Bethenny Frankel, and multihyphenate Trisha Yearwood and many more. The Atlanta International Gift and Home Furnishings Market® runs Tuesday, July 10 – Monday, July 16, 2018 (Temporaries Wednesday, July 11 – Sunday, July 15). The Atlanta International Area Rug Market® is Wednesday, July 11 – Sunday, July 15, 2018. For more information, visit http://www.AmericasMart.com/July. AmericasMart is the nation’s only global wholesale marketplace housing the world’s single-largest collection of home, gift, area rug and apparel merchandise. The largest of AmericasMart’s 16 annual Markets and shows, The Atlanta International Gift & Home Furnishings Market and The Atlanta International Area Rug Market in January and July are the ignition switch for global retailing with buyers from every U.S. state and as many as 70 countries discovering product in more than 1,500 showrooms and more than 3,500 temporary exhibiting companies. ICON HONORS, the home and gift industry’s most celebrated recognition program, is produced and staged annually by AmericasMart.